Today, the remediation system is operational but its effectiveness is marginal. A containment boom sits on Newtown Creek to prevent the oil that continued to seep into the Creek from dispersing throughout the Creek, and into the East River and beyond. Six recovery wells are operated for ExxonMobil by Roux Associates in the “off-site” subsection of the spill, as per the consent order. Four additional wells run for BP Amoco are located in the “Amoco site” section. Clean-up operations run by ExxonMobil have also occurred in the “on-site” section, however distinguish how much of the historic spill has been addressed is difficult since these efforts have aimed at remediating additional spills occurring on the property in recent years. The wells use a dual-phase recovery system which draws down the water table in the area in order to bring oil towards the pumps. The water pumped out is treated for contamination and pumped into Newtown Creek. The petroleum product removed is shipped by ExxonMobil to New Jersey for reprocessing and sale. ChevronTexaco has acknowledged no responsibility for the spill and refuses involvement. ExxonMobil has only recovered a small portion of the historic spill, and the rate of recovery is slowing. In 2003, ExxonMobil admitted that recovery wells in the “off-site” section of the spill – the largest section, containing an estimated 14 million gallons – have recovered less than 4 million gallons of spilled product. (Fn 6) The remediation system in place has been characterized as rudimentary, and includes no plans to address the contaminated soils and sands once the oil is fully removed. Additional wells are necessary, but remain uninstalled due to difficulty in obtaining the necessary access to private property. ExxonMobil’s containment boom system at the Peerless bulkhead is a particularly interesting form of remediation, since it does nothing to keep oil out of the creek. The company admits that nearly 28,000 gallons of oil have been skimmed off the surface from inside the boom since 1993, and no mention is made about how much oil or contaminants escaped into the creek. 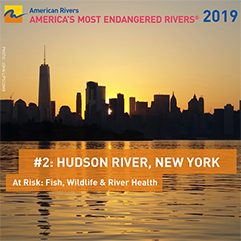 During every patrol of the site, Hudson Riverkeeper has witnessed brown globs of oil and a rainbow sheen both inside and outside of the containment boom, in some cases stretching hundreds of yards from the boom. The spill continues to threaten the environment and communities around Newtown Creek. First, it has destroyed the water supply beneath Greenpoint. The Brooklyn aquifer is frequently cited as a desperately needed drinking water source in the case of a drought, loss of upstate reservoirs or the failure of connecting aqueducts. Today, due to the presence of carcinogenic hydrocarbons, the aquifer cannot be directly tapped as a drinking water source. The aquifer still serves as a recharge zone for the aquifers in the southeastern portion of Queens County that are tapped as a source for drinking water. (Fn 7) Until a complete clean-up of the spill has occurred, including removal from sand and soil, the water will continue to be undrinkable. 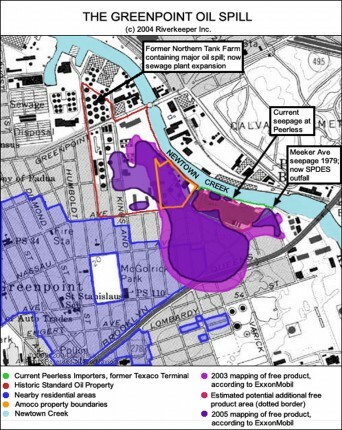 Third, future Greenpoint development must grapple with the fire hazard that the oil-soak soil presents. As construction digging nears the spill, even a small spark could set the ground on fire. This is a serious concern, given that some portions of the spill come within 10 feet of the surface. Land owners and potential developers expose themselves to serious liabilities, possibly stalling any meaningful efforts to safely redevelop Greenpoint. Development without full remediation of a property could seriously impair the efficiency of future spill remediation. While the Exxon Valdez spill in Alaska was abhorrent because of its destruction of pristine wilderness and fishing grounds, the Greenpoint spill is perhaps more insidious because of its threat to a large human population. More than 100 homes and dozens of businesses are situated atop the spill. Human activity on Newtown Creek and New York Harbor is increasing exponentially, as a waterfront renaissance is underway. Yet, no comprehensive human health studies have been done to determine possible threats—this despite the documented presence of carcinogenic constituents in the spill. In 1997, when questioned by the NYC Council Committee on Environmental Protection, Mobil confessed to having no plans to investigate how human health had been harmed.